We’re famous! (Sort of…) and Wow! Did you see that?? It’s absolutely amazing to me how quickly time goes between blog postings! I feel like I just posted the other day and yet here it is almost THREE weeks later! I’m so sorry everyone! Well, to get you up to speed. I’ve been booking a lot of Bar/Bat Mitzvah’s over these past three weeks (FUN!!). And I’ve even booked a couple second weddings, too. I LOVE shooting those! My newsletter went out in the mail. And they look great! I’ve been getting a very positive response from that. If you’re interested, let me know and I can add you to the mailing list. When you join, you’ll get the newsletter which has a ton of information from photo tips, to recipes and some savings on packages, too. This past weekend, we took the kids up to Ann Arbor to meet the new football coach, Rich Rodriguez. If you don’t already know, my husband played football for UM in the late 80’s/early 90’s. He got to go up and meet Coach Rodriguez on Saturday night with all the former players and the wives and kids were all invited up on Sunday afternoon for a brunch and the UM/Ohio State basketball game. Well, we met Coach and is he ever a nice guy! He’s so young, too! I think he’s maybe in his mid 40’s. Anyways, it was a great day. UM kicked OSU’s tushie, which I was very thankful for. We were sitting right in front of a real lot of the OSU fans and they were so…well, you get the picture. Typical college rivalry. Lots of bantering back and forth with some choice words (none from me!). So on Monday morning, we find out that OUR IMAGE is the THE IMAGE on the new blog that introduces Coach Rodriguez! It’s hilarious!!! Go check out http://www.mgoblue.com/. Then go to varsity sports, then football. When you get to the blog section about Coach Rodriguez, you’ll see an image of a big guy with an “M” hat on, me in a gray sweater, my son wearing a black and gray striped button-down, and my daughter shaking hands with Coach! SEE!!! We’re famous! 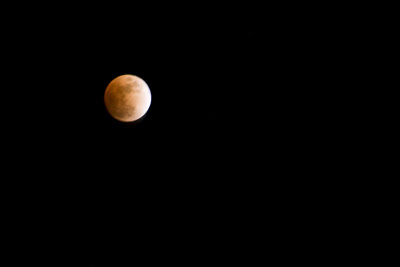 Ok, so tonight, there was a total lunar eclipse. We waited just until American Idol was over before we braved the cold to go check it out. I’m so glad that we did! I’ve never seen an eclipse before (I know, I know…) and WOW! Was it unbelievable! So beautiful. I had to share it. I’ve never experimented with taking images at night, especially when it was SOOO cold (5 degrees! ), but I’m so glad that I did. I can’t believe it’s taken me so long to see one of these. I can’t wait for the next one!